Twice. No hope for you, Monty - there is only pain. Again, yes other people on this show have epicly suffered. But suffering is pretty much all Monty has done: it’s the shallowness of his portrayal that makes his one note actions so problematic. This pretty much sums up Hannah - the overbearing Tiger Mom who was entirely defined by her oppressive and domineering presence in Monty’s life. Another one-note character whose shallowness only emphasises how much of her is a stereotype. Contrast that with Abbie! Abbie and Clarke have repeatedly been at odds, but that is used as a character point to build both of their stories. That has been built into their characters and, despite all of their repeated opposition to the other, neither side has ever completely written off the other. Abbie never turned her back on Clarke - and vice versa - no matter what crimes or sins apply. We know this, it would beyond imagining for this not to be true - yet Hannah sells Monty out the minute he steps out of line. The contrasting portrayal of motherhood is stark and brutal and let’s be honest racist. It’s long been a disgusting project of white supremacy to paint mothers of colour as incompetent breeders even as it elevates White motherhood to an almost divine state for White women. Ironically this warped motherhood is then used as a vehicle to justify destroying families of colour just as The 100 did with its cruel murder of Hannah twice. We can’t talk about POC who seem locked into endless cycles of suffering without much else without coming to Raven. Again, like Lincoln, she had vast potential. An engineer, a technical wizard with excellent skills that even made her valuable (albeit secondary) in the first season. We’re beginning to a glimmer of this in the battle against Allie - and, after all, given her skills shouldn’t be she front and centre? But she isn’t - like the first season her technical and computer skills are not the main fight against Allie - Clarke’s trip looking for oddly coloured blood is. Not only that, but Raven is frequently portrayed as not only not helping but actively causing damage to the cause. She’s even presented as indirectly responsible for Hannah’s second death at Monty’s hands. Her essential skill set is actually becoming something of a liability. Yes I hope for more, and there’s definite potential for more that is not just missed - but almost story-breakingly missed. Instead of Raven being defined by her competence and ability she is defined by… pain. We’ve touched on some of her treatment in the first season, being sidelined by Clarke - but it’s also notable that Raven was tortured not once, but twice in the first season alone before being shot and suffering her characteristic leg injury. Again this could have been an excellent chance to examine injury and Raven’s adaptation to her disability; but despite touching on it, she’s never given enough real attention to follow it through to a full storyline. All we see if pain and angst - which in turn leads her into Alie’s clutches. For yet more rounds of torture. Seriously, does she get a punch card or something? For every 5 torture sessions you get a free box of bamboo slivers? The sad thing is with both her epic skills and her disability we could have made an excellent showcase of how valuable and precious she is. We could have had Raven reaffirm her worth, her power, her capability and proven it again and again as a central and vital figure to the group. Hey, we would even have not put her love interest into the plot box! What did he actually risk providing Raven with a storyline beyond her weekly torture session? The character which bothers me the most is Indra played by the very amazing Adina Porter. Indra was first introduced to us as the leader of Tondc, but that position of power was really short lived. Sure, Tondc was destroyed by a missile strike but it’s notable that Lexa and Clarke knew the attack was coming and did nothing. We have not seen Indra in charge of another territory since the destruction of Tondc. Even though Indra began with her own community to run, she was still second to Lexa. As much as I was saddened by the death of Lexa, I had really hoped that this would give Indra’s character a new lease. Instead, The 100 created some convoluted reason involving tech and night blood to bypass Indra as a leader to search for someone else. This effectively set Indra up to be a permanent second despite her skill, wisdom and bravery. When Indra wasn’t busy following Lexa’s orders, she serves as a mentor to Octavia. In the Survival of the Fittest, Octavia takes on one of Indra’s Grounders and though she is defeated, Indra sees strength in her resilience. 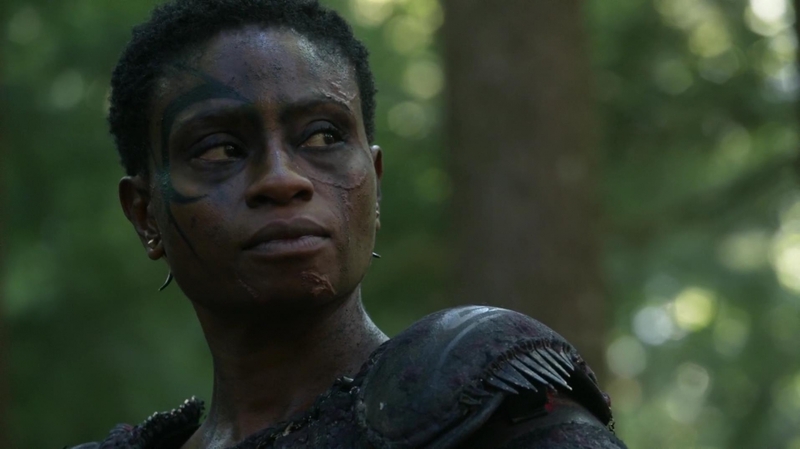 Indra spends her time training Octavia to become a warrior and being a second ambassador to Grounder society for Octavia. When she is not tutoring Octavia in fighting skills, she’s busy dispensing wisdom. Between Lexa and Octavia, Indra is little more than a sidekick/servant. Her entire character revolves around servitude so much that beyond knowing that Indra knew Lincoln since he was a child and that she is fiercely loyal to her people, Indra is absolutely a blank slate. Does she have a family? Does she have a lover? Does she even have any friends? Indra is nothing but a trope. They’re powerful, but they’re wrong. Always wrong. Pike is obviously and horrendously wrong now: in fact that is his whole character. The terrible leader. The hater (and, really, shows have got to try and show their “nuanced thinking” but having POC as raging bigot storylines. We can see what you’re trying to do. It’s not impressive). This is the sum total of his character. Like so many of those we’ve written about here, he’s less a character than he is a role. Or a force. Or a plot point. Pike isn’t a realised character with independent set of goals and personalities - Pike is the opposition Clarke, Octavia etc have to overcome. He doesn’t exist as an independent person because he’s a concept, a narrative tool. And Jaha? Jaha takes an award for wrongness because he has never been right. From his decisions on the Arc to his decisions upon landing to his decisions on seeking the City of Light and, now, his being chief acolyte of his master Abbie. Which manages to make his leadership both utterly wrong while, at the same time, removing any actual power and agency from him. Hey, at least Pike gets to be terrible and awful in his own right, Jaha is just the vessel of awfulness now after seasons of utter incompetence. The thing is, other leaders have screwed up - Clarke, Kane, Abbie, Lexa - but they’ve also all had a chance to redeem themselves, change their minds, learn, grow and STILL be leaders. Does anyone think, should Pike change his mind, he will retain leadership? Or do you think his Redemption Train will involve him conceding leadership and kneeling before some white leader (my money is on Kane), assuming he even manages to live through this? Do we think, should Jaha ever get Alie out of his skull (and live which, again, is so very unlikely) that he will still be a leader? We know this won’t happen - these characters are both epic tales of incompetence and awfulness, eternal antagonism until they’re either put in their place or killed. And at this point we’re almost hoping it happens sooner rather than later just to let this saga of incompetence and evil end. Other than that we do still have a number of minority faces lurking in the background as minor characters (There’s also Bellamy - but we mentioned on our previous post why this is a problem and we’ve spoken before about which minorities are likely to be more prominently “portrayed”). Jackson the loyal doctor following Abbie around. Miller, random soldier number three stood at the back of the crowd pretending to be a returning character. Sinclair, technically there since the beginning of season 1 but always lurking in the periphery. His relationship with Raven was powerful respectful, deeply necessary for both characters - and little more than a footnote to the greater story. A footnote that has now been firmly ended with Sinclair, adding another body to the POC death count. We’ve seen it said about shows from The Falling Skies, to The Walking Dead as a defence when we see minorities dying off disproportionately - and it’s never ever true. No matter how high the bodies pile up, these shows always have a small cadre of cis, straight, white able bodied men we KNOW will live - or at very least seem to be sporting plot armour that could deflect light sabers. Sometimes even when it boggles the mind how they could have survived in a Disney movie, let alone a post apocalyptic world where “anyone can die”. The 100 is no exception to this - we have three candidates that continue to shock me episode after episode with their continued survival: Marcus Kane, John Murphy and Jasper Jordan. Anyone can die? Kane has now joined his, what, third rebel group? He was plotting to the point of terrorism, against Jaha when they were back on the station. He was plotting against Abbie on the ground. Then he tortured her. Then fell in love with her at some point after being trapped under-ground by a bomb blast that managed not to kill him. Somehow. And now he’s part of another rebellion, was captured red handed as a member of that rebellion and is STILL alive. Lincoln just got executed for existing while being a Grounder, basically (he didn’t do anything else. Him doing anything else would have involved him actually having a storyline). Pike should stop trying to execute Kane and have him lead his troops into battle - watching every bullet magically miss his forces. Jasper? He’s staggering around being a loose canon of self-absorbed manpain in an oppressive violent police state. And no-one has shot him. At this point Jasper could take up clog dancing on unexploded nukes and I’d expect him to live. I think he has literally pissed off every single faction - Alie’s zombies, the Grounders, Skaikru - all of them have wanted Jaser to die at some point.